Perhaps there was another topic on this but it didn't turn up for me when I searched. Are you the tyrant, who cast them to the sea? One day you'll be among the dead. Check Out Flashback Records ( Islington / Angel tube station ) . They usually have very good selection of records. Bought decent copy of Hyksos LP for 20 gbp 4 years ago. Sister Ray at Soho is also good.There's another record store just a few feets from Sister Ray. On The Floor Records in Camden was quite good last time I went (January). Lots of new BM/DM upstairs and some 2nd hand downstairs. Sisteray and Reveal Records in Soho can be good. 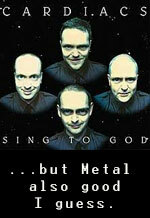 Metal selection can be hit or miss but they have loads of other stuff. The Music Video Exchange is down the road. All second hand but a lot of stuff they seem to price by Popsike. Also Rough Trade in the Old Truman Brewery has loads of stuff from all genres. Not much metal. I'm not sure if I'll find the time or even afford it, but since we're off to London over this weekend: Are the store recommendations still valid? Any newbies or closed ones? Crypt of the Wizard should be mentioned in this thread!